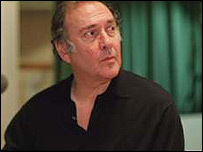 Dramatist Harold Pinter has said that he is to give up writing plays and focus on other forms of writing. Speaking on BBC Radio 4's Front Row, the 74-year-old said: "I think I've stopped writing plays now, but I haven't stopped writing poems." "I think I've written 29 plays. I think it's enough for me. I think I've found other forms now." Pinter's best-known works include The Caretaker, The Homecoming, Betrayal and The Dumb Waiter. A revival of his first full-length play, 1957's The Birthday Party, opens at Birmingham's Rep Theatre next month. Pinter told Front Row presenter Mark Lawson that his energies were "going in different directions, certainly into poetry". "But also, as I think you know, over the last few years I've made a number of political speeches at various locations and ceremonies," he said. "I'm using a lot of energy more specifically about political states of affairs, which I think are very worrying as things stand." Pinter published a volume of his anti-war poetry, entitled War, in 2003. The collection, which criticised the conflict in Iraq, won him the Wilfred Owen award for poetry, named after the poet who died in World War I. His most recent play, Remembrance Of Things Past, was published in 2000, and performed at London's National Theatre.